Would you commit to pray regularly? We need regular, fervent prayer partners and encouragers to pray for our ministry, with and for us, and for those we serve. 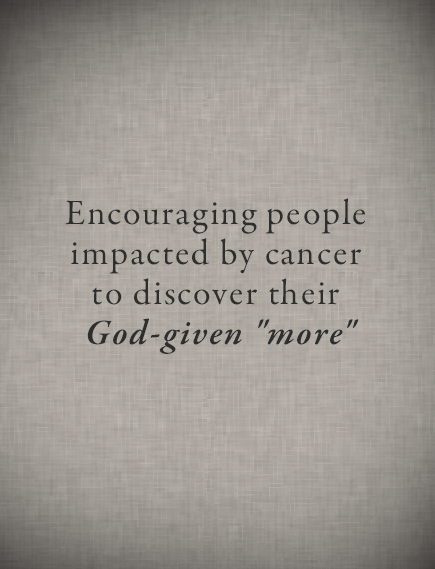 Made for More is able to encourage others through faithful partners like you. Large or small; companies, institutions or individuals, – everyone makes a difference. Tuition Scholarships for breast cancer survivors in Horses.Healing.Hope. If you would like to learn more about Made for More, please contact us today. We would be honored to talk to you. If you feel led, please take a moment now to support the ministry. Your support encourages those whose lives and families have been impacted by cancer or other life struggles. Please contact us using the above link or use one of the methods below to donate. Check the reccurring payment box option during checkout to contribute monthly. As a thank you for becoming a Made for More partner today, we’d like to send you a signed, complimentary copy of In His Grip, A Walk Through Breast Cancer.